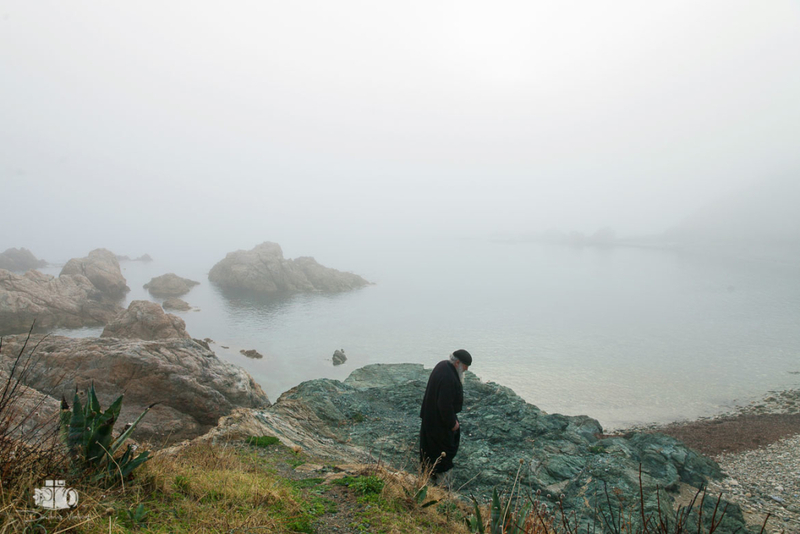 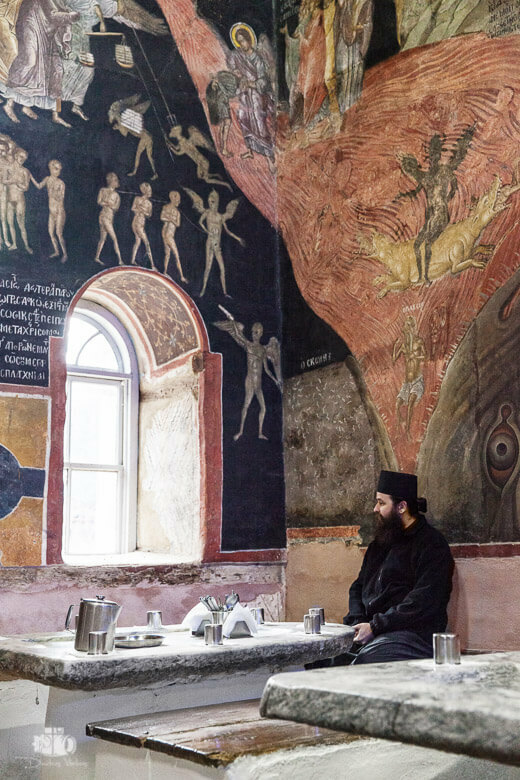 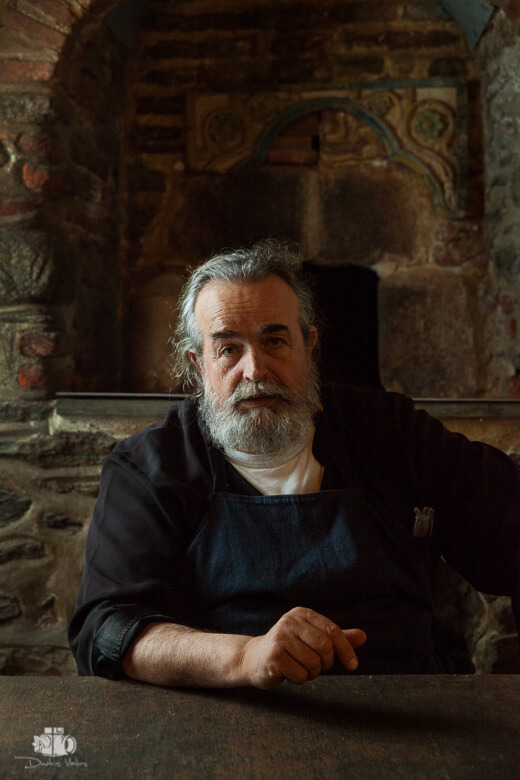 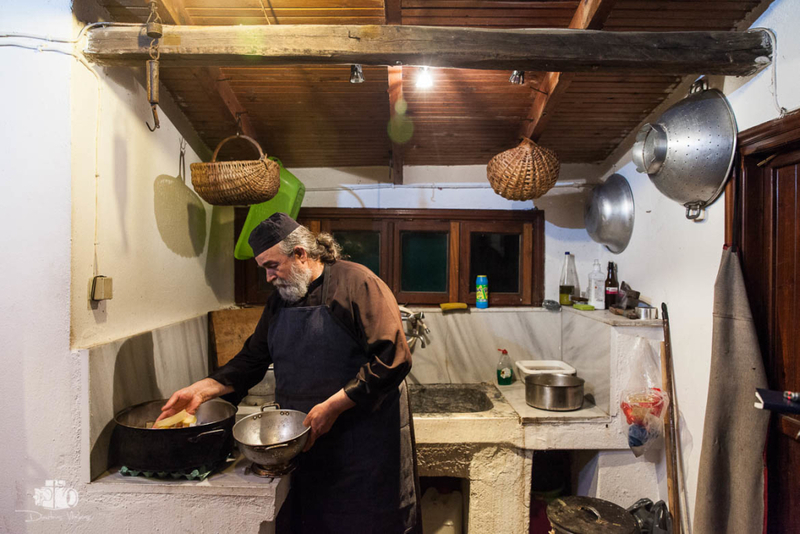 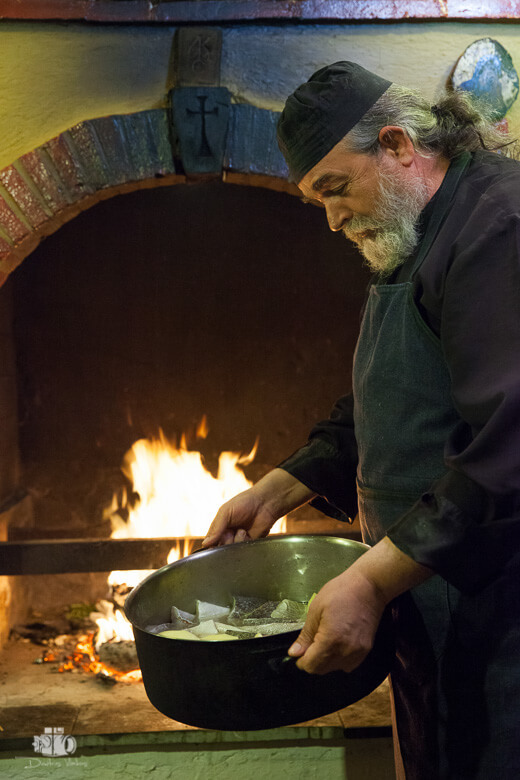 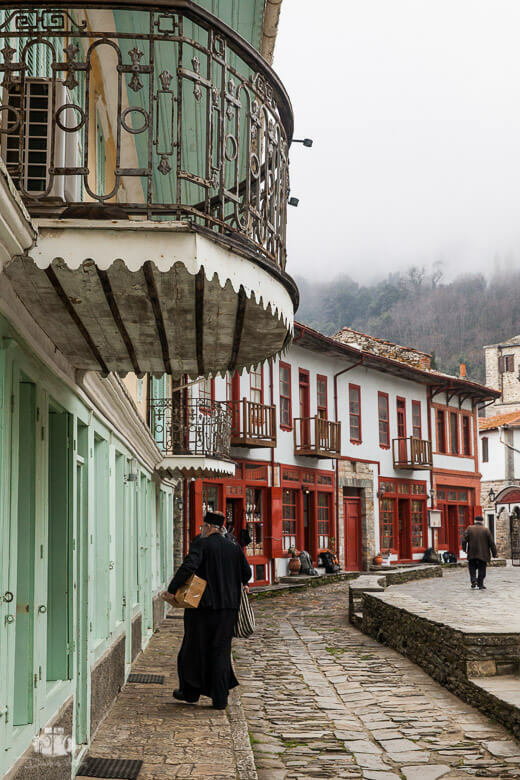 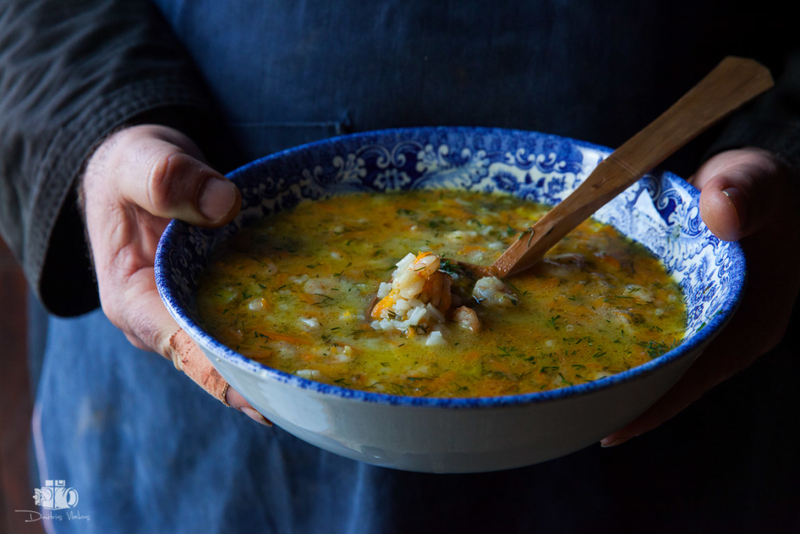 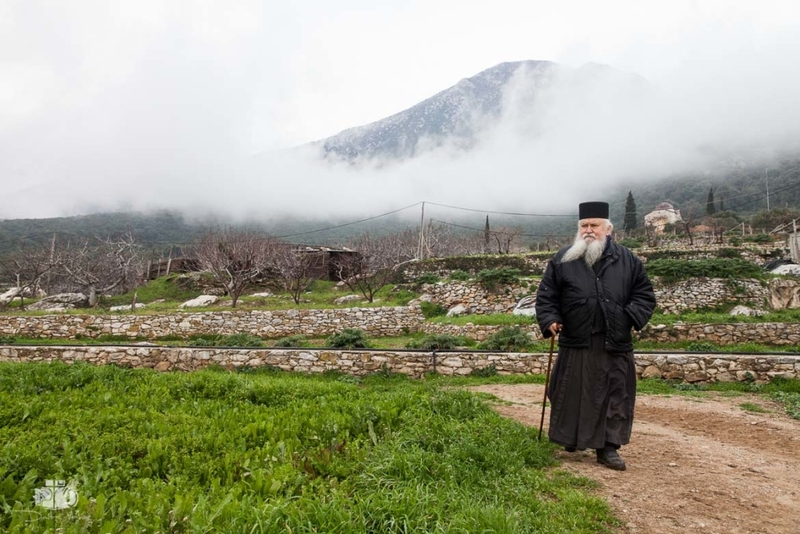 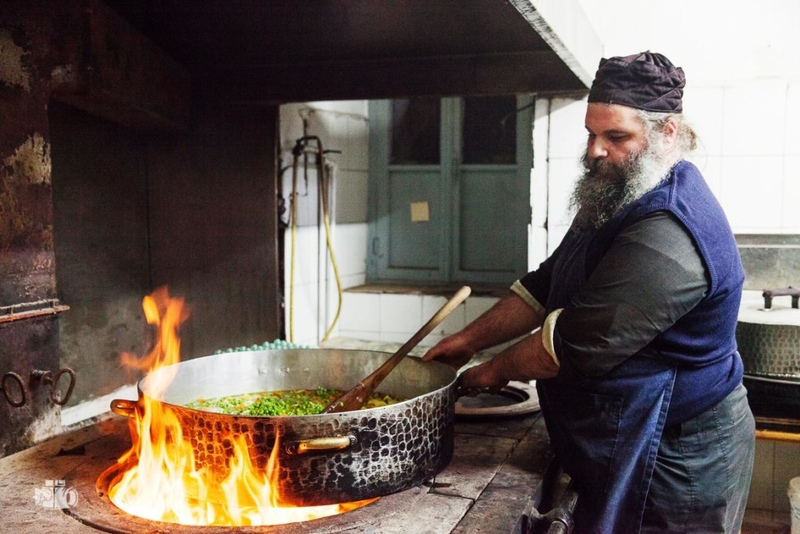 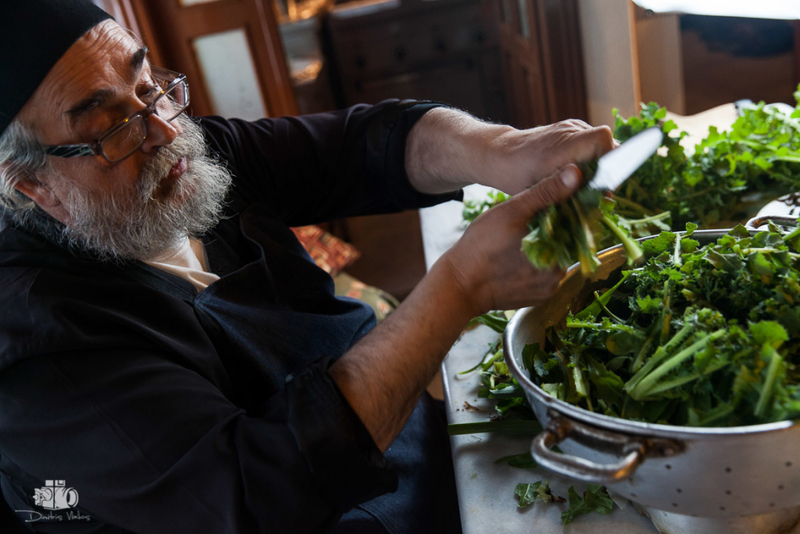 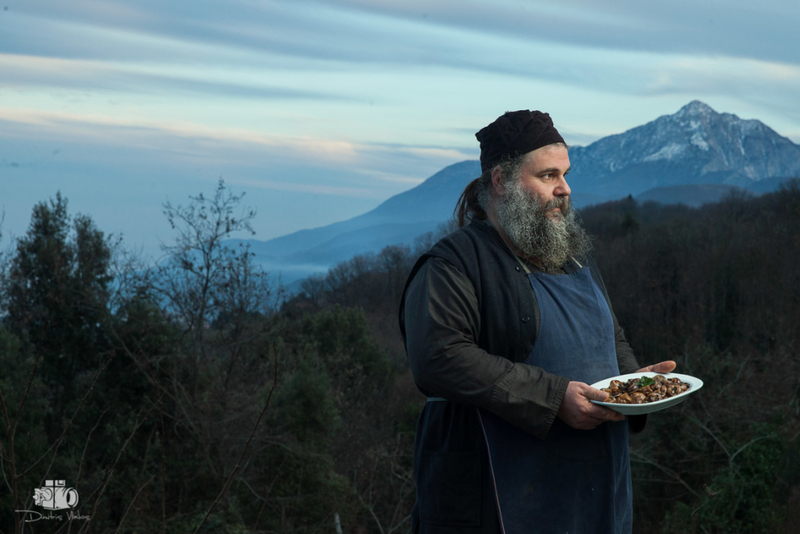 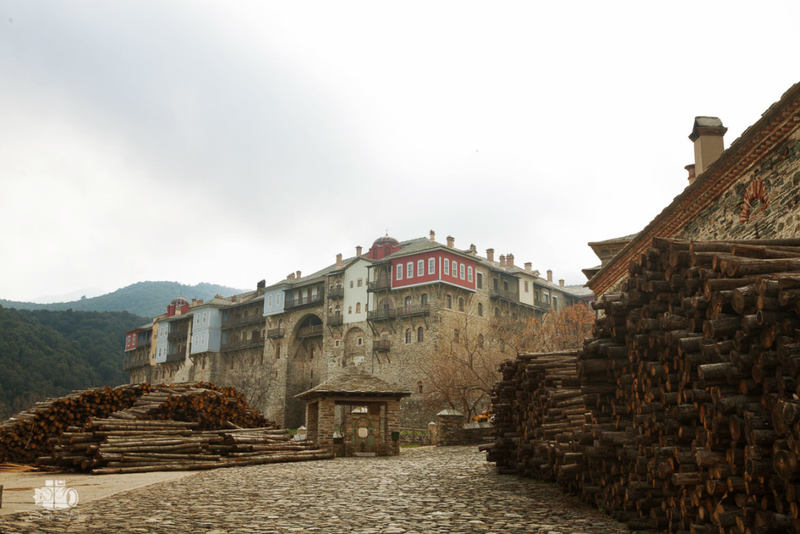 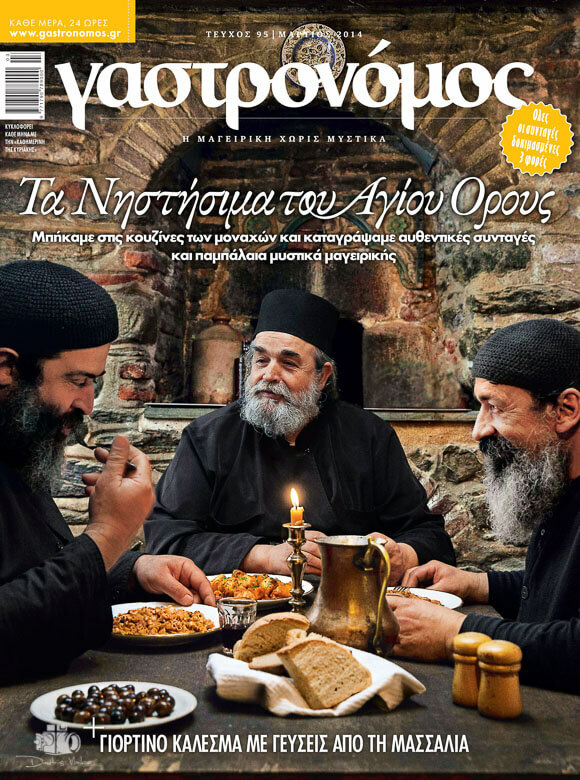 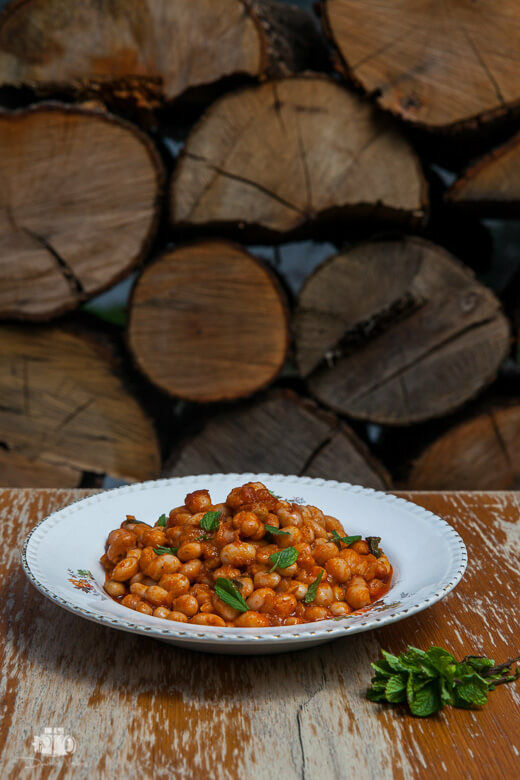 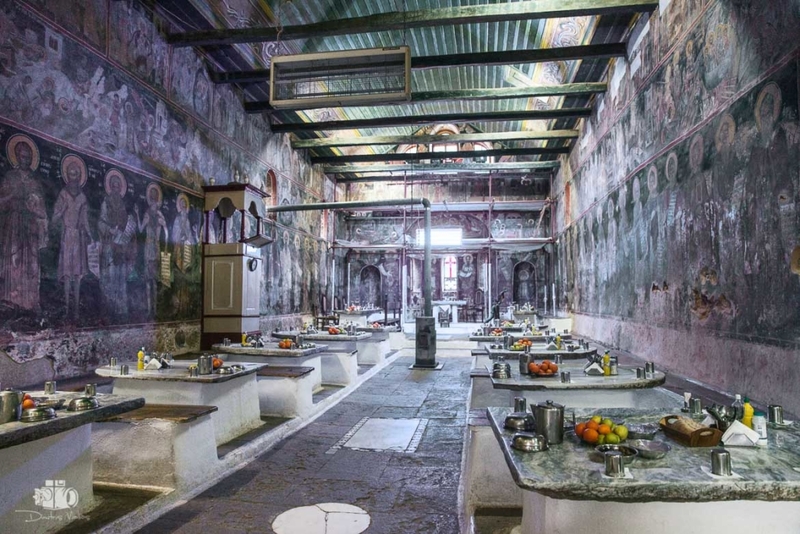 As Greece entered the pre-Easter season of Lent, Kathimerini newspaper’s food magazine, Gastronomos, published a special 35-page section on the lenten cuisine of Mount Athos, featuring recipes that have been a best-kept secret for centuries. 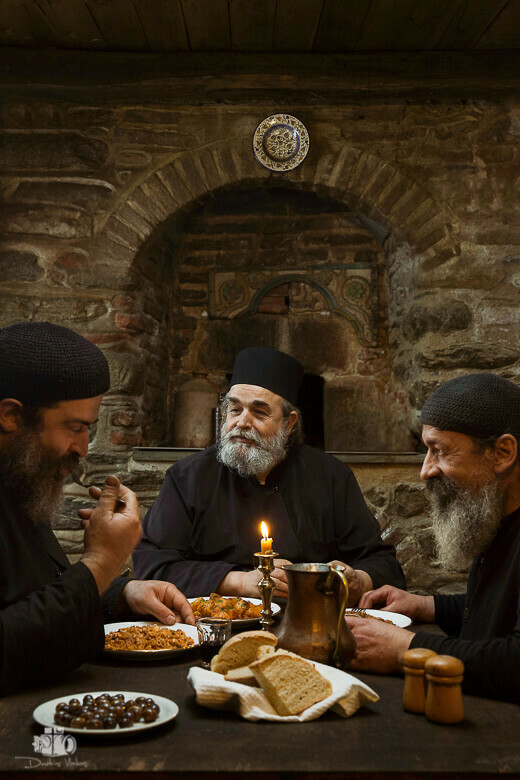 It is a photographic record of the prominent figures of monastic cooking seen though the most basic of human enjoyments – food. 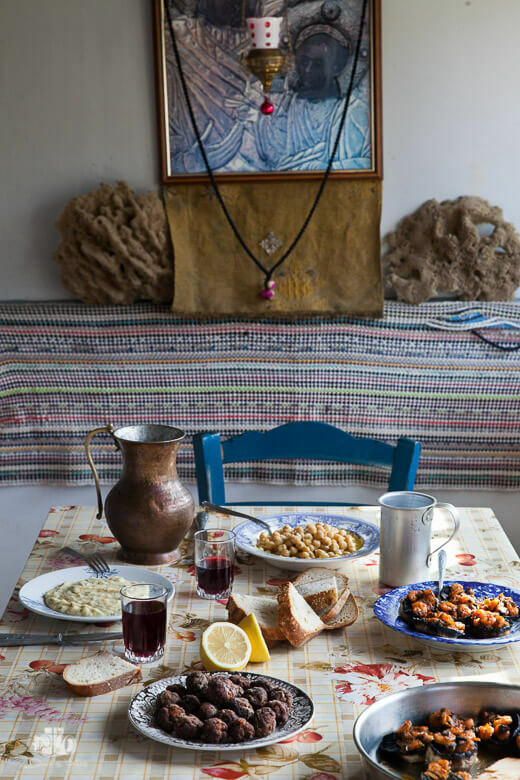 In creating this historically and religiously important record of all the rich flavours of Athonias, I feel privileged to have had the opportunity to experience, sample and preserve it in images. 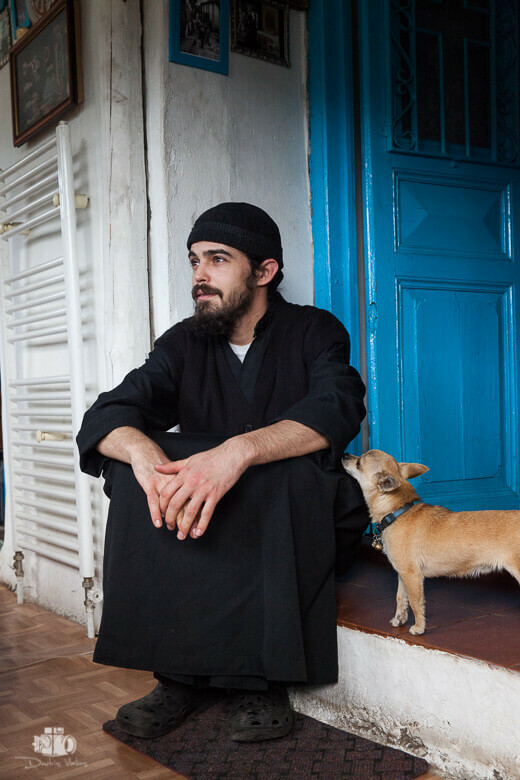 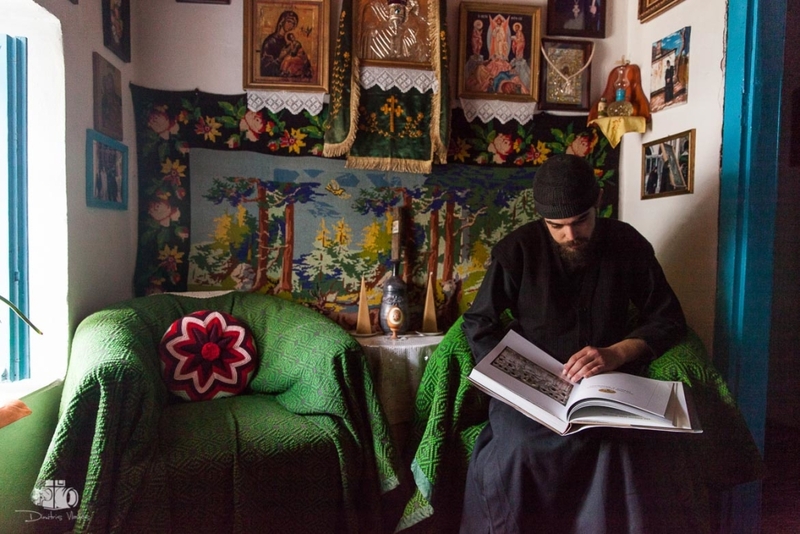 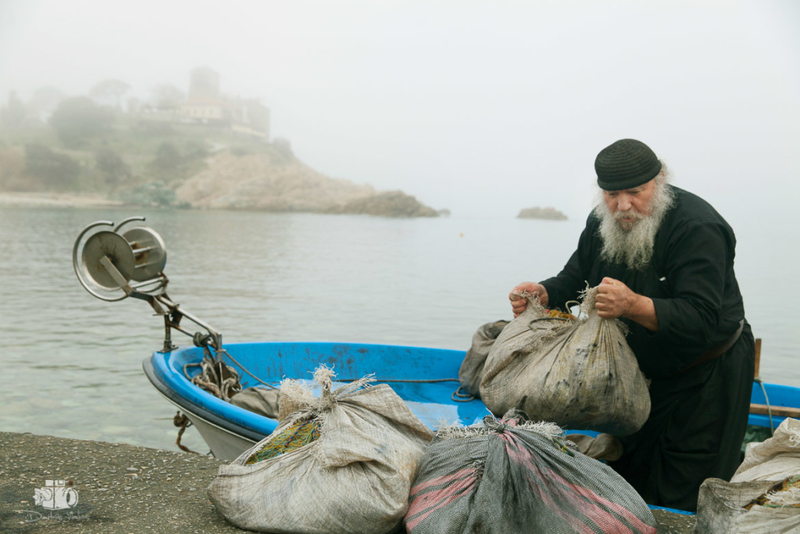 The subjects are monks whose hard work is accompanied by respect for the “garden of the Virgin Mary”, or Panagia, as Mount Athos is also known. 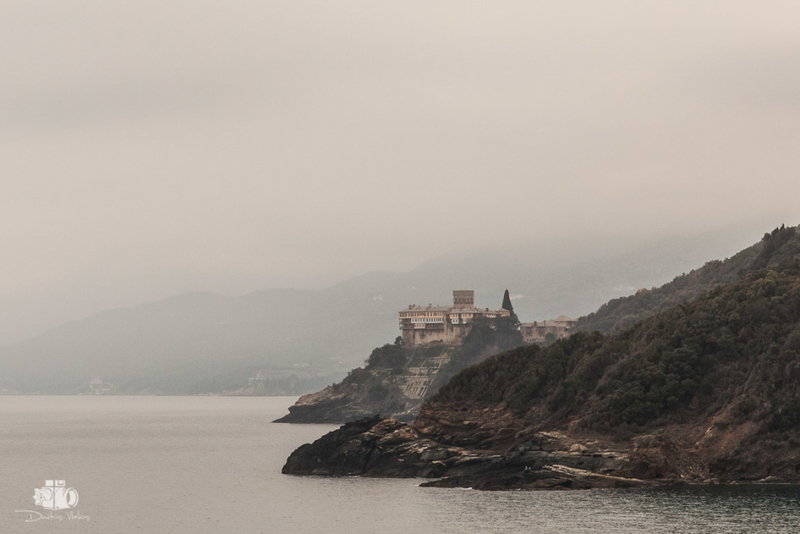 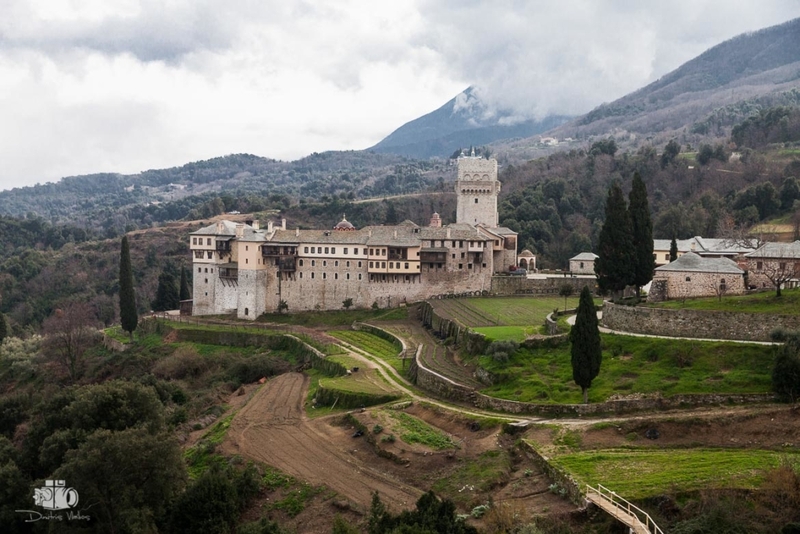 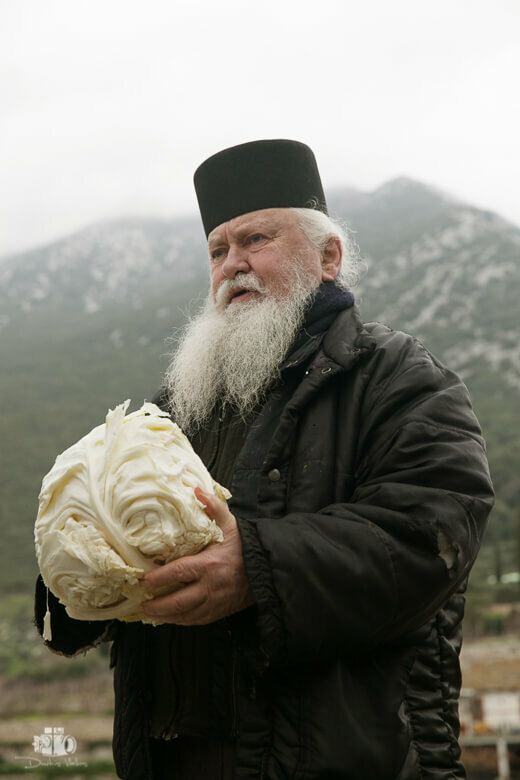 The Agio Oros or Holy Mountain – is an autonomous monastic state on the Athos Peninsula and is among the few in the world, along with Lhasa in Tibet and the Vatican in Rome. 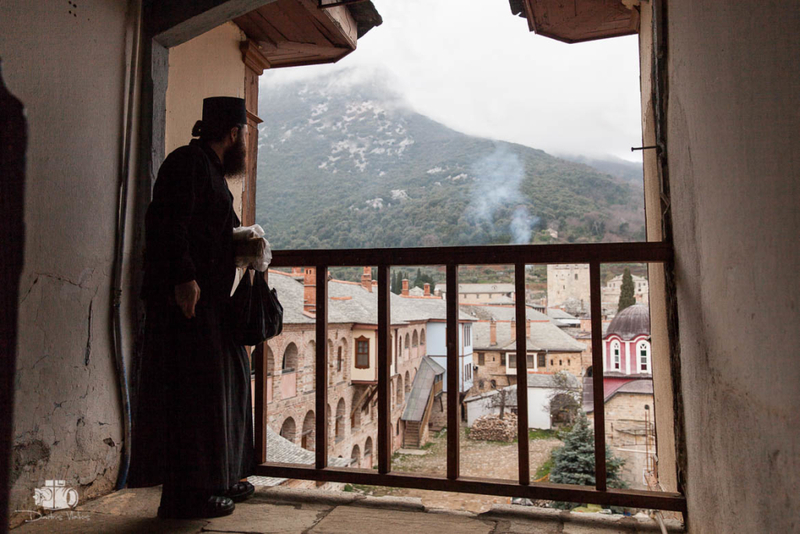 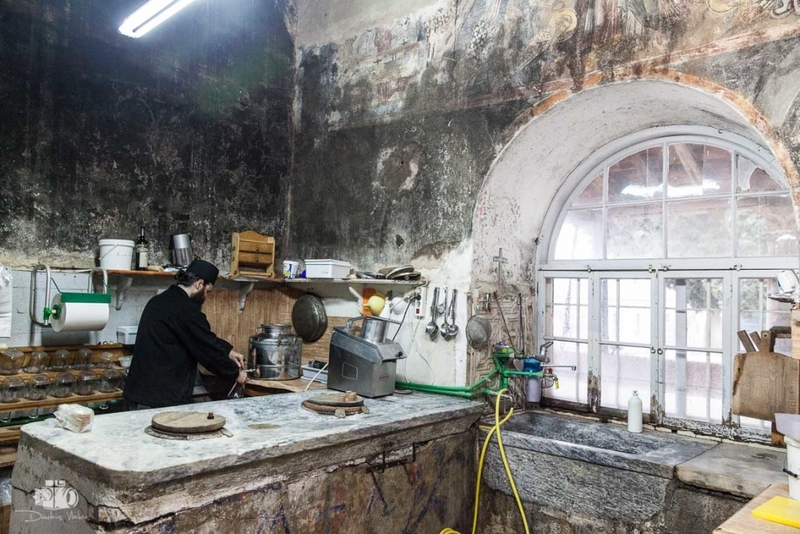 It has been there for 1,000 years, since the Pontian monk Athanasius, later known as St Athanasius the Athonite, founded the Monastery of the Great Lavra and athonite monasticism. 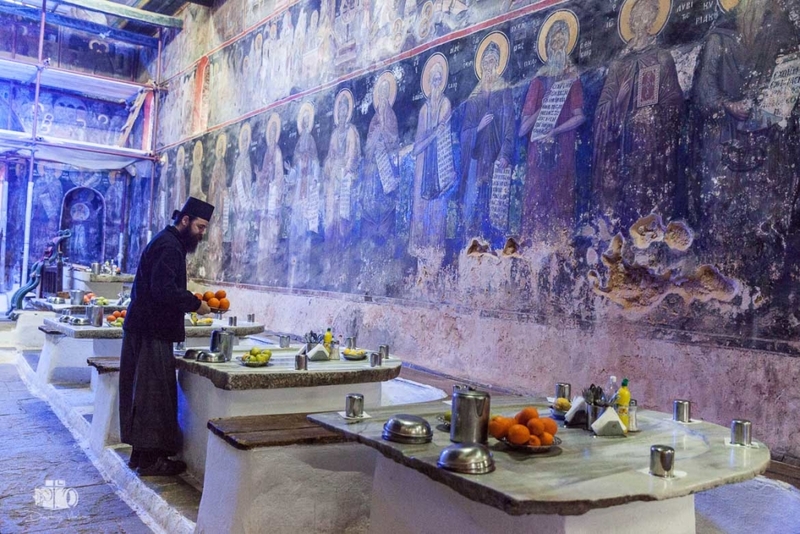 It is a self-governing section of the Greek State, located on the Athos Peninsula of Halkidiki, in the Macedonian region of northern Greece.It includes 20 monasteries and monastic institutions and is the centre of Orthodox Christian monasticism, possessing monumental treasures of inestimable national, historical, religious, literary and cultural value on a global scale. 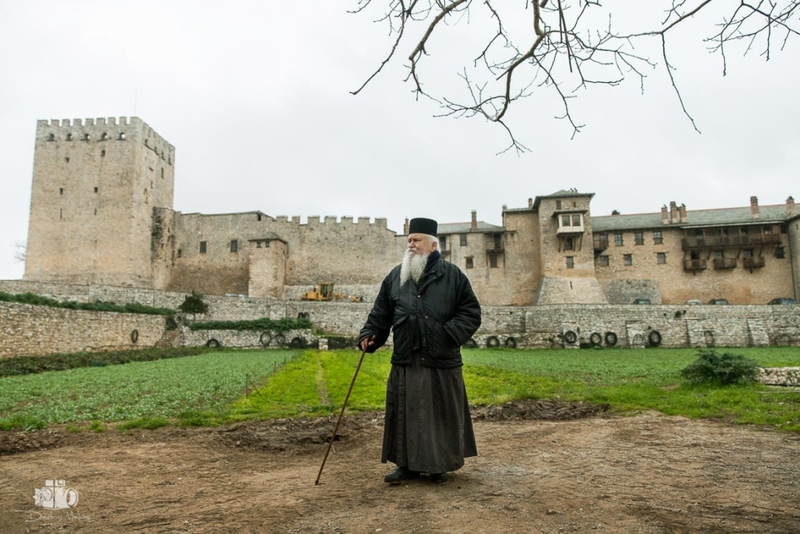 Each area of the peninsula consists of a dominant monastery and various other monastic settlements around it (cloisters, cells, huts, seating, retreats). 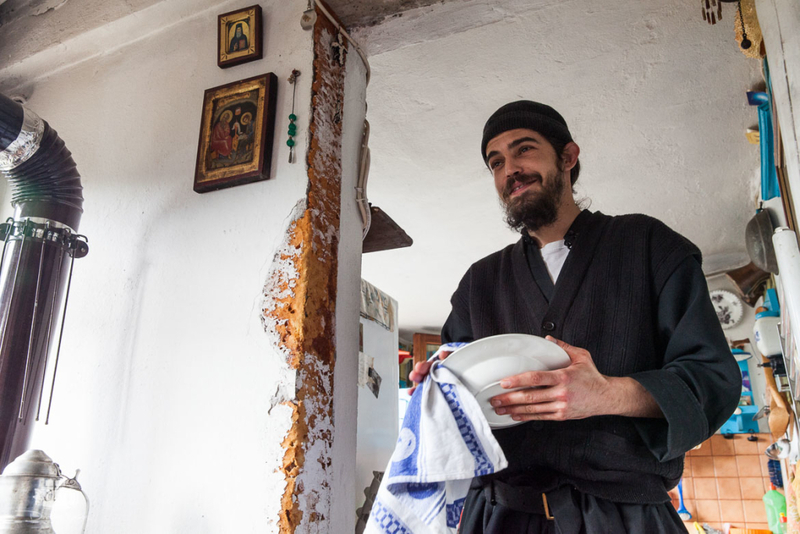 All of the monasteries are communal, meaning the monks share common services, prayers, housing, dining and work. 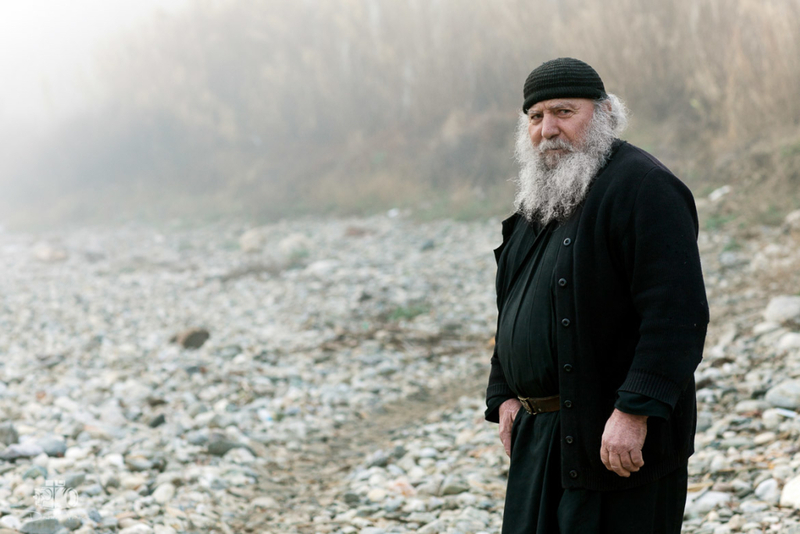 Inaccessible to women, it is a unique destination for the Orthodox in search of true faith. 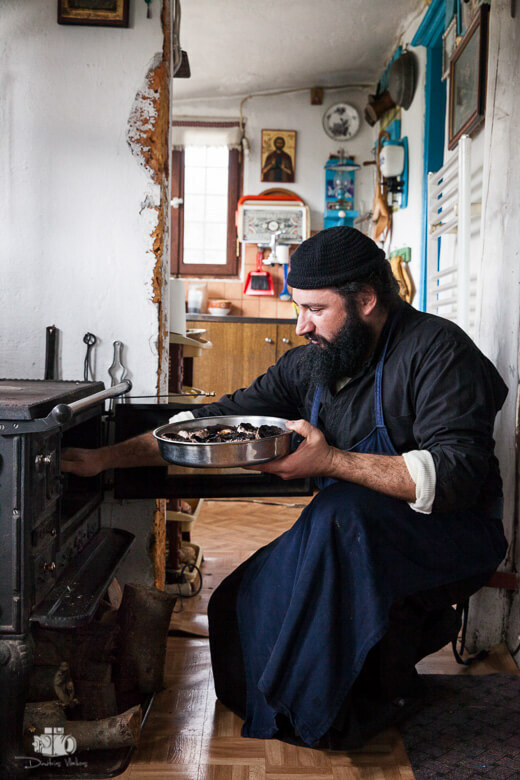 The monasteries are part of nature as it generously offers all of its beauty and wealth, nourishing not only with its purity but with its extraordinary flavours. 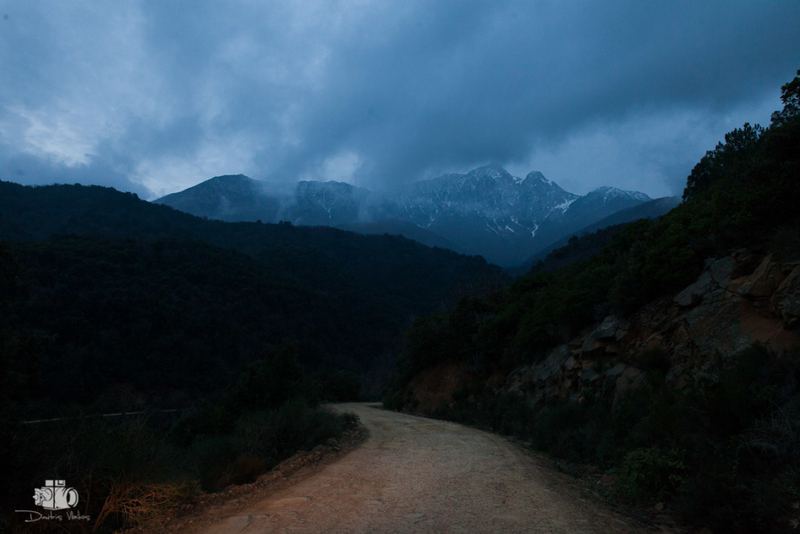 The bounty of nature has gifted it with the best it had to offer. 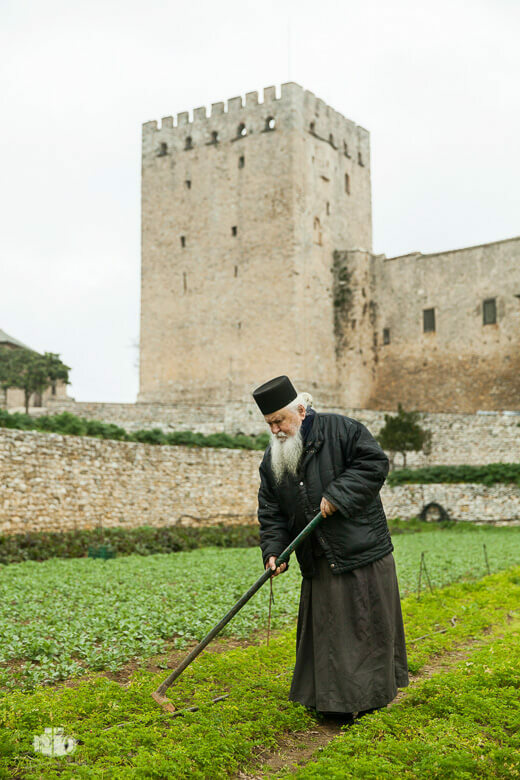 The monks’ respect of it and their arduous labours are the unrivalled components of their daily lives. 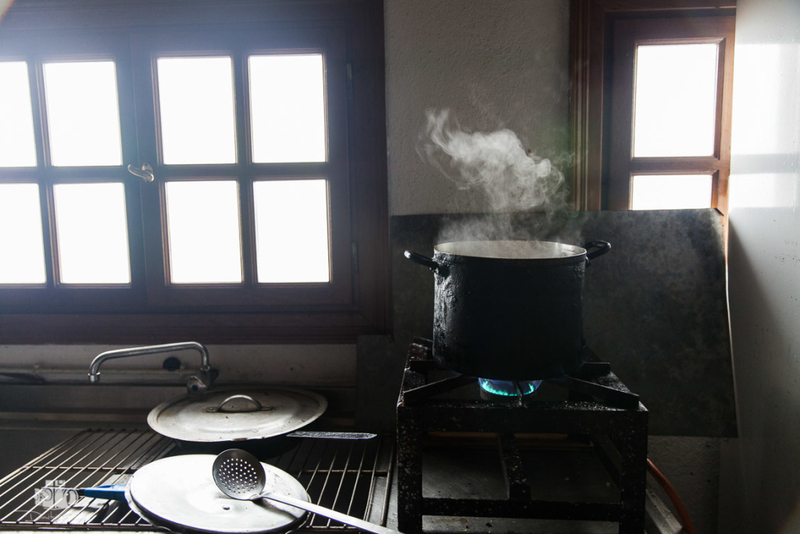 They produce various goods to support themselves which are known throughout the world. 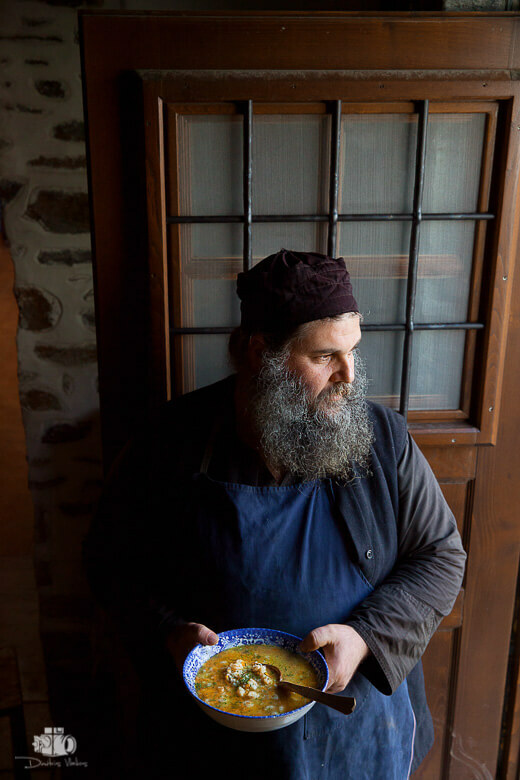 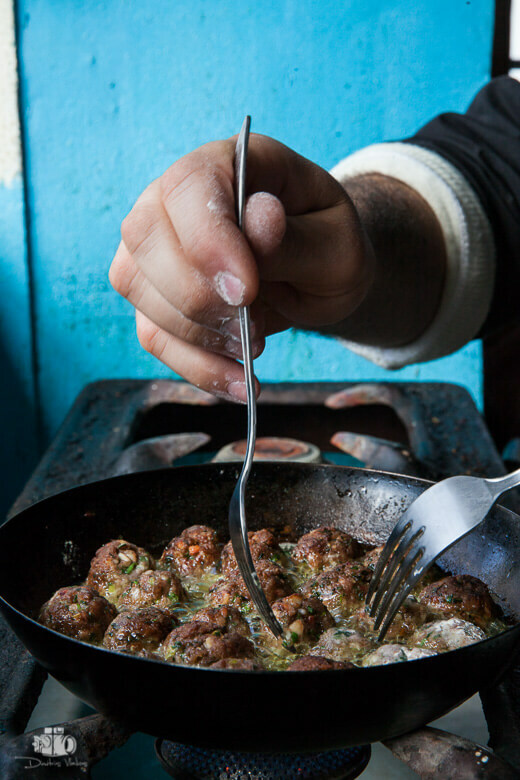 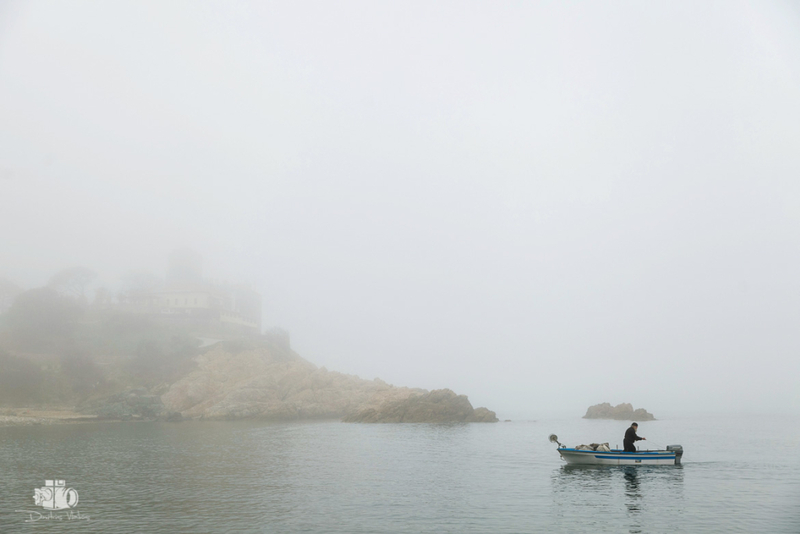 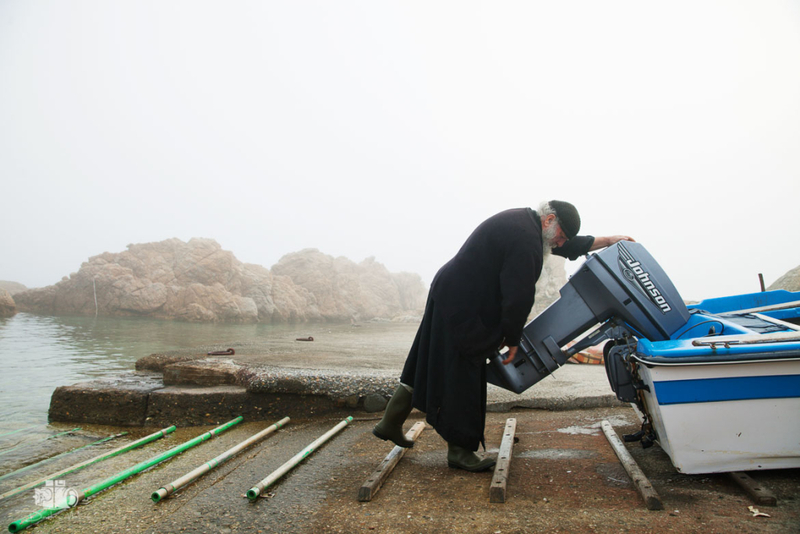 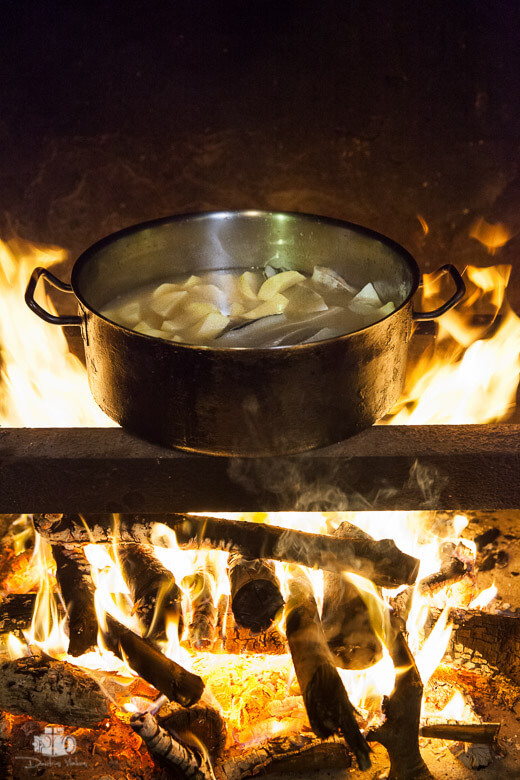 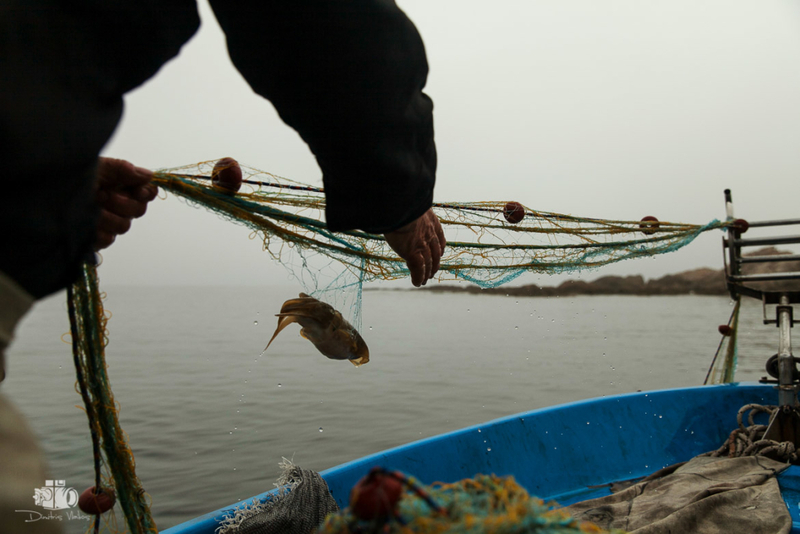 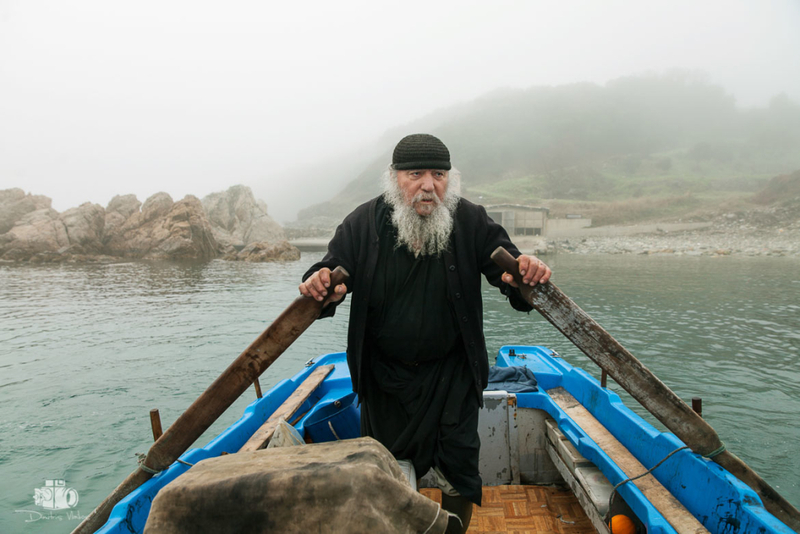 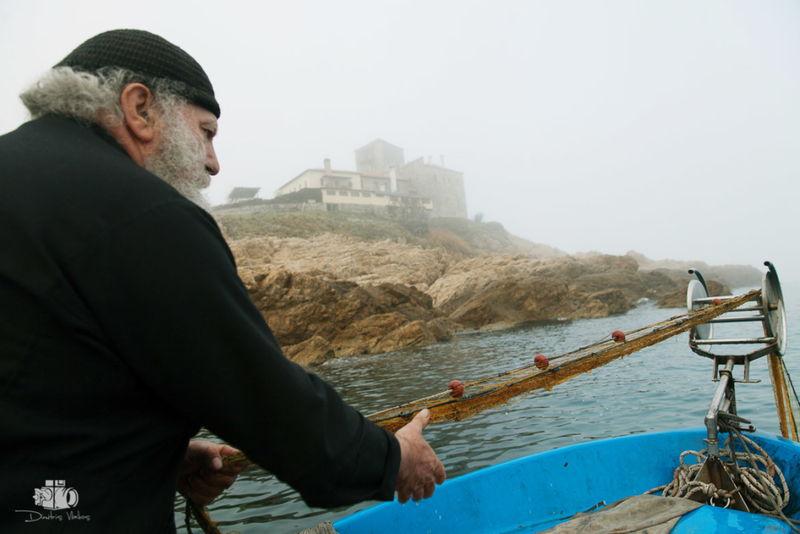 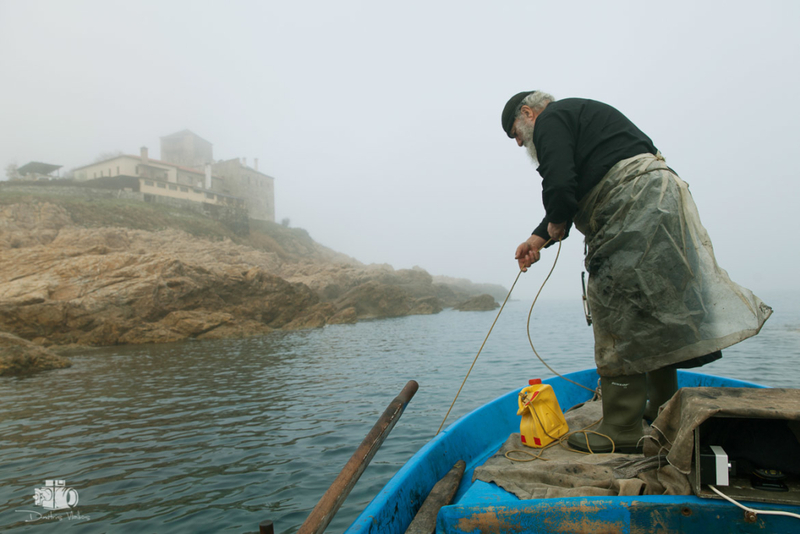 Farmers and fishermen contribute to the basics of their cuisine, providing valuable goods and ingredients essential to all types of Athonite recipes. 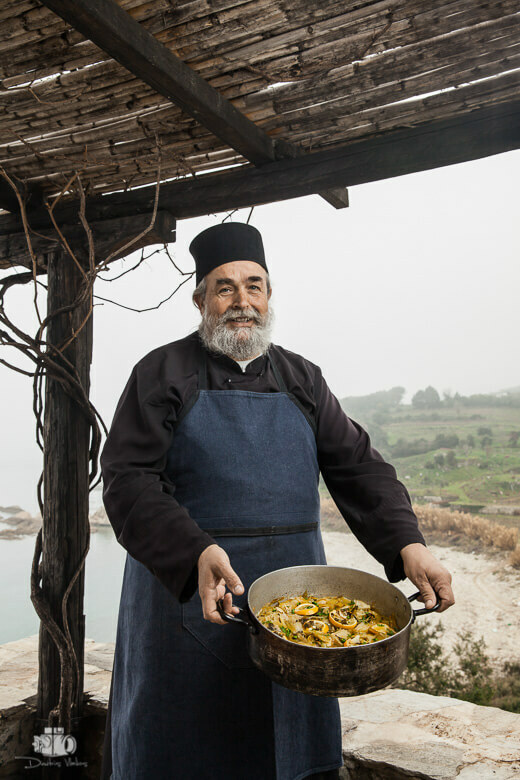 As guests of Athonite chef Father Epiphanios, we took part in this communal life for week in Kathisma, Mylopotamos, next to the blessed vineyards, the dolphins we watched from the shore, and the fisherman and farmer who respectfully converse in this melting pot of gastronomic knowledge and experience.